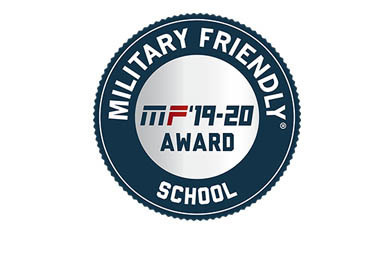 For the ninth consecutive year, Walsh University has been recognized as a 2019-2020 Military Friendly® School by Victory Media, the leader in successfully connecting the military and civilian worlds, and publisher of G.I. Jobs, STEM Jobs, and Military Spouse. Continuing its mission to provide veterans and their spouses with the finest choices for post-secondary education, VICTORY has released the 2019-20 Military Friendly ® Schools list. Since 2008, the Military Friendly® Schools list has come to set the standard for higher education institutions to provide the best opportunities for veterans and their spouses. This prestigious list provides a comprehensive guide for veterans and their families using data sources from federal agencies and proprietary survey information from participating organizations. Institutions earning the Military Friendly ® School designation were evaluated using both public data sources and responses from a proprietary survey completed by the school. This year 766 schools earned this prestigious designation. Walsh University is also a proud participant in the Yellow Ribbon Program, a financial provision arrangement for military students as part of the Post-9/11 Veterans Educational Assistance Act of 2008. This program is a partnership between Walsh University and the VA to fund tuition expenses that exceed the highest public in-state undergraduate tuition rate. This makes a Walsh education more affordable for all veterans. The 2019-2020 Military Friendly® Schools list will be published in the May issue of G.I. Jobs magazine. The list can also be found at www.militaryfriendly.com. Methodology, criteria, and weightings were determined by VIQTORY with input from the Military Friendly ® Advisory Council of independent leaders in the higher education and military recruitment community. Final ratings were determined by combining the institution’s survey scores with the assessment of the institution’s ability to meet thresholds for Student Retention, Graduation, Job Placement, Loan Repayment, Persistence (Degree Advancement or Transfer) and Loan Default Rates for all students and, specifically, for student veterans. The Military Friendly ® Schools list is created each year based on extensive research using public data sources for more than 8,800 schools nationwide, input from student veterans, and responses to the proprietary, data-driven Military Friendly® Schools survey from participating institutions. The survey questions, methodology, criteria, and weighting were developed with the assistance of an independent research firm and an advisory council of educators and employers. Ernst & Young, a global leader in assurance, tax, transaction, and advisory services, independently evaluated the scoring methodology used for the Military Friendly® Schools list using the criteria set forth by VIQTORY. The services performed by EY are were limited to advisory procedures and do not provide assurance over the scoring methodology.